Whiel they look liek relatively small falls, a great volume of water comes over them during the rainy season. 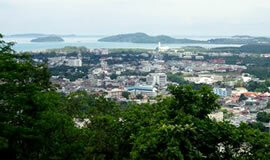 The trees, watercourses, and pools nearby provide one of Phuket's loveliest scenes. The park headquarters and a small restaurant with an excellent view are also at Ton Sai. 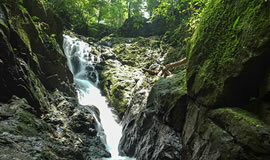 Located near Thalang Town, 22 km. from Phuket Town. 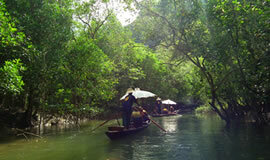 Located near Phuket International Airport, the national park covers an area of 90 square kilometers. The park stretches all the way to the island's northern tip. There are a number of interesting places to visit : Nai Yang Beach, Nai Ton Beach, Mai Khao Beach, Sai Kaew Beach, Mangrove Forest. 22.28 square kilometers of virgin forest are coverd by this park, which also actively conserves a number of wild animals; they would otherwise be extinct in fast-growing Phuket. It is a center for study of the environment and the forest vegetation is spectacular. Giant trees supported by huge buttresses are thick with creepers and climbers of every description. One species of palm, the Governor's Palm or White Back Palm (palm lang khao in Thai) is especially rare. 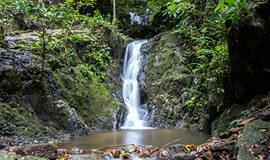 Langurs, barking deer, mouse deer, deer, bear, wild boar, monkeys, gibbons, and many species of birds inhabit the forest. Khao Phra Taeo also serves as one of Phuket's most important water sources. Situated in Sirinat National Park, near Ta Chatchai on Phuket's northern tip, the mangroves--saltwater swamps with unique eco-systems much prized by scientists searching for clues about adaptation and evolution--cover about 800 rai. Anyone with an interest in horticulture will be interested in the many unusual perennial plants found here: mountain ebony (kong kang bai lek), red cycas (prong daeng), black myrsina (samae dam), the Lady's Nails quisqualis (leb mue nang), and various creepers and climbers are among the more significant. There are also many mangrove-dwelling animals with unique evolutionary characteristics. A nature trail has been cleared for the convenience of visitors with signs indicating and explaining the various species.